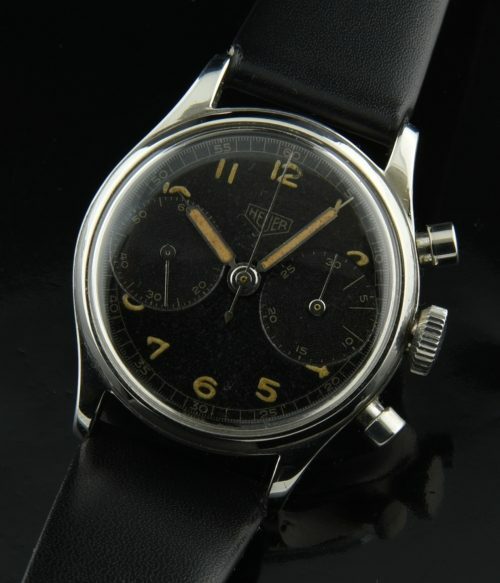 This is a stunning a rare circa 1942 HEUER MILITARY 34.5mm stainless steel vintage watch. The all original dial with ALL ORIGINAL fabulous lume and hands looks incredible. The massive chrono sub-registers ad a purposeful look. This dial is truly preserved with the striking luminous and original pencil hands. This watch has an all-dial appearance and looks larger than 34.5mm. The steel case is well-preserved and most importantly, is adorned with original SWISS MILITARY markings. The manual winding Landeron chronograph movement is absolutely sparkling and accurately working after a meticulous recent cleaning. The crown also appears original (of course unsigned). We have NEVER seen one of these with military markings. This is a special investment grade HEUER which I highly recommend.